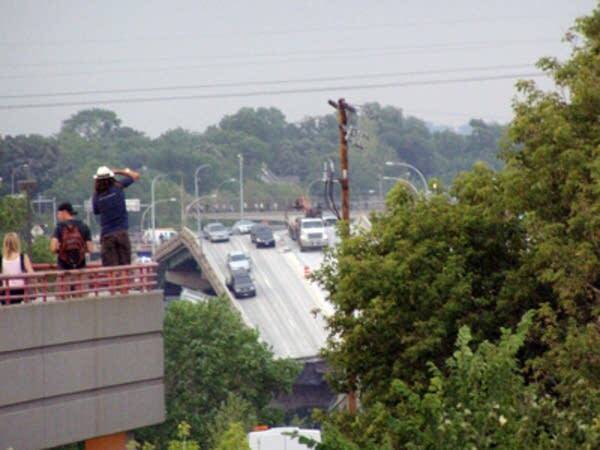 The concrete-and-steel bridge buckled suddenly at the height of rush hour traffic, compounded by the fact that thousands of fans were heading to a Twins game at the nearby Metrodome. 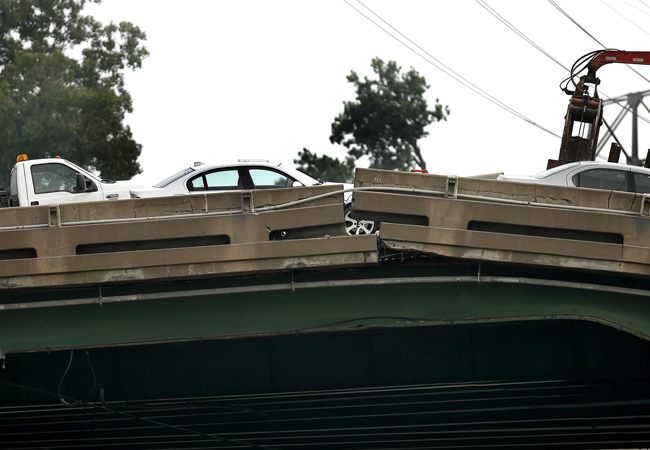 Officials says they still don't know how many cars were on the bridge at the time of the collapse, but traffic was bumper to bumper. They estimate there were at least 50 vehicles -- probably more. At a Thursday morning briefing, Police Lt. Amelia Huffman revised the estimate of dead downward. "This morning, the medical examiner's office only has four sets of remains." Initial reports of seven people killed were based on the best estimates authorities had Wednesday night, she said. She did say the number was expected to change throughout the day, as search efforts continue. Jamie Winegar's car was one of those on the bridge. The Houston mother was in Minneapolis to help her daughter move to college. They had just returned from a shopping trip with three other family members, when the bridge gave way beneath them. "All I remember feeling is just feeling this boom, boom and then we just kept and my husband was saying, 'Are you all alright? Are you alright?' because ... it fell four times. So we know we fell... I don't know, 40 feet? I don't know how far we fell." The Winegar's vehicle landed on another car and came to rest on concrete, narrowly avoiding falling into the Mississippi River. "We all had our seat belts on. We had five people in the car. We feel so lucky because you didn't feel like you were going to live through it," she said. Melissa Hughes was also on the bridge. She says she wasn't sure what was happening at first. She says she noticed objects in the air and she knew they didn't belong there. "I swear I saw construction workers suspended in the air and just kind of that feeling, that free-fall feeling. It felt like we did that twice," she said. "And I heard a loud, at that time I just stomped on the brake and held my steering wheel, and then heard a loud smash and saw my back window break." 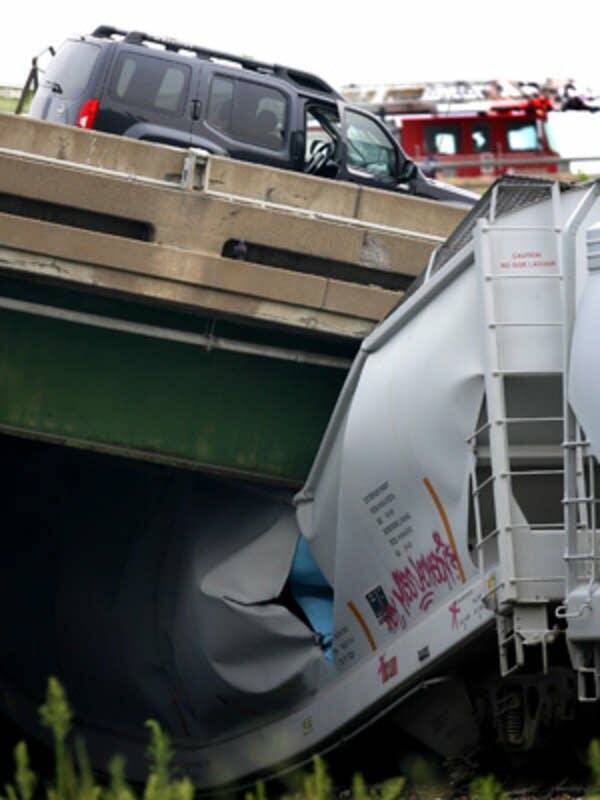 A school bus filled with children also slid down the embankment as the bridge buckled. But none of the children were seriously injured. The bridge spans nearly 2,000 feet. 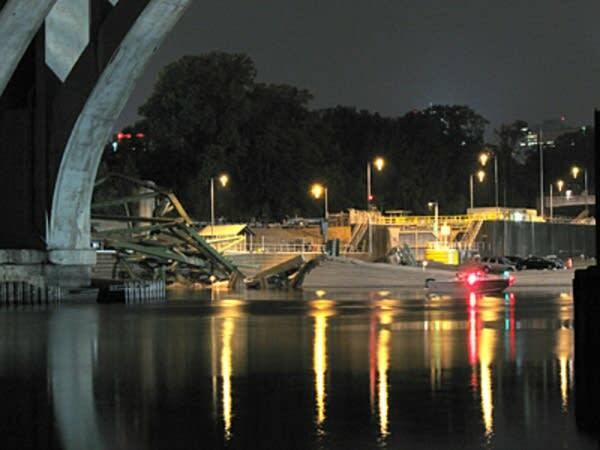 The section that fell into the river is at least 500-feet long. Sections of the pavement with crushed vehicles are still visible above the surface of the water. Rescue workers scrambled in boats to reach those victims. Dozens who survived the fall, were rushed to nearby hospitals. In a news conference soon after the collapse, Gov. Tim Pawlenty called it "a catastrophe of historic proportions." "It is obviously a catastophe, and first and foremost we want to say to the families who are being impacted by this that our hearts and prayers are with you," the governor said. "But we also want to make sure that you know that we are doing everything we can to make sure that we respond as quickly as we can to the needs of this emergency." 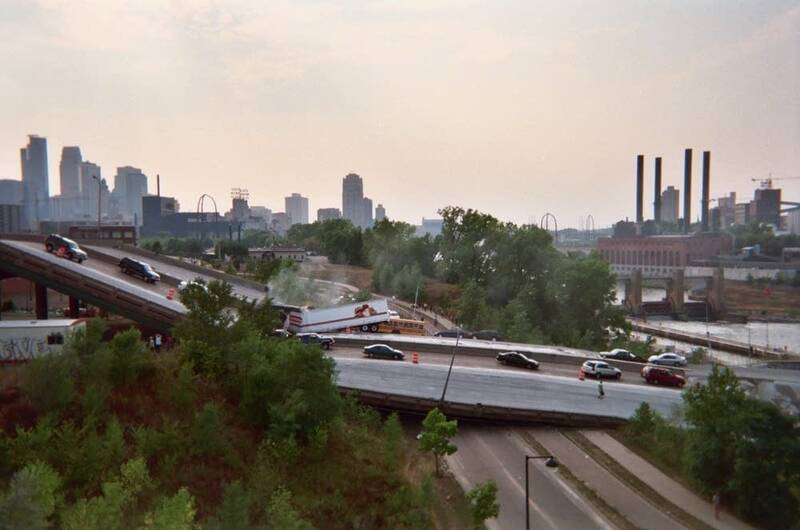 Pawlenty says the bridge was inspected in 2005 and 2006 by the Minnesota Department of Transportation, and that inspection found no structural deficiencies with the bridge, just some cosmetic and minor repair items. In fact the bridge was undergoing resurfacing work at the time of the accident. While a cause has not yet been pinpointed, Homeland Security officals say there's nothing to suggest terrorism in the collapse. The accident drew thousands of onlookers who lined the banks of the river to watch the rescue effort. "Why ain't people getting out of the rescue people's way?" said Joe O'Leary, who drove to the scene from his home in St. Paul. "It's just ridiculous. People sit there and the vehicles can't get around them." It was common to see police officers shouting at people to stop running in front of vehicles or cutting across the few open roads available to rescue workers. But many other observers, like O'Leary, watched respectfully from a distance. "It's really too bad," he said. "A lot of families are going to lose somebody. And it makes you wonder how safe our bridges are? How safe are our bridges?" It was a comment repeated many times by many people. Just around the block, University of Minnesota student Sara Decker stood by two portable water coolers that she had hauled to the scene from her church. The air was hot and humid and there were many takers. Decker said passing out water was the only thing she could think to do. Decker says she had been in a car waiting to cross the bridge when the accident happened. "All I can do is thank God that I'm safe. You never think that something like this is going to happen and so I just praise God that there's so many people that are here that are helping and doing what they can," she said. Minneapolis Fire Chief Jim Clack called off the rescue effort a few hours later. He said it was too dangerous to send rescue workers into the river to look for victims. "It's too dark. There's too much debris in the river to continue in the river tonight. We will at first light be back in the river working again," he said. Clack says when searchers resume their work in the daylight, they will switch their operation to recovery mode. "Which means we're going to be very careful, not to hurt any rescuers or any other people working at the site and we're going to continue to operate in that mode through the evening and through the day tomorrow," he said. 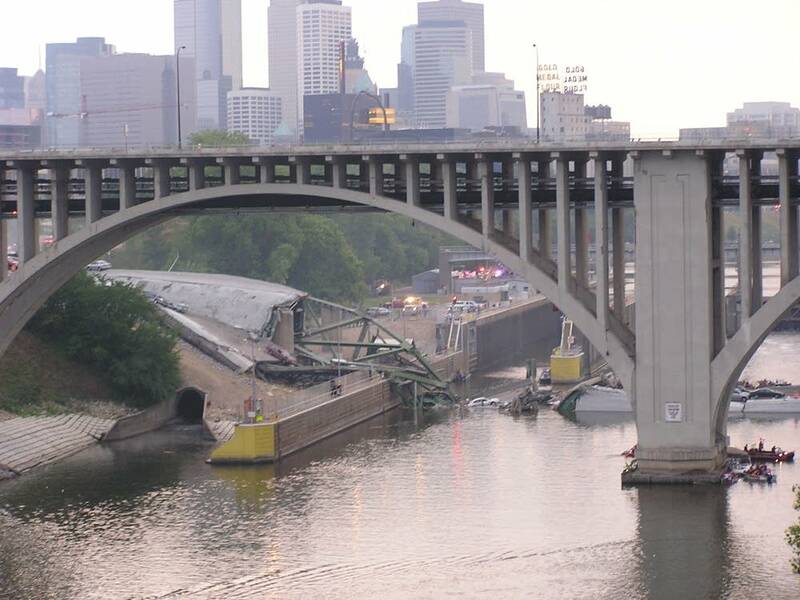 The bridge collapse presents a major traffic challenge to already congested Twin Cities freeways. Officials quickly announced that they will make nearby Highway 280 into a freeway to accommodate extra traffic. 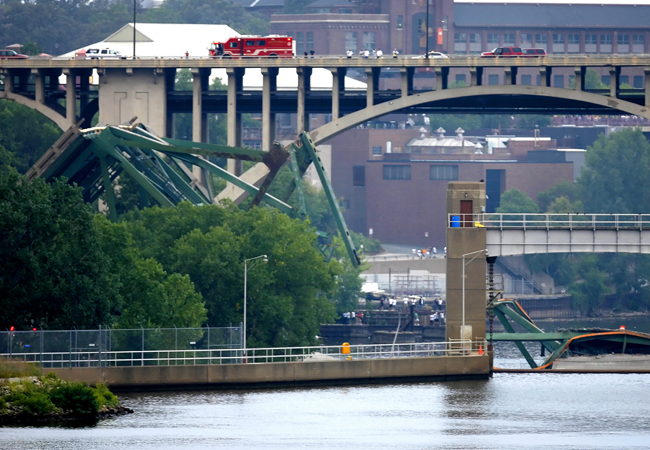 The bridge collapse also disrupts barge traffic on the river as huge chunks of concrete and rebar and numerous vehicles remain underwater. It's a situation that will likely take years to fix. 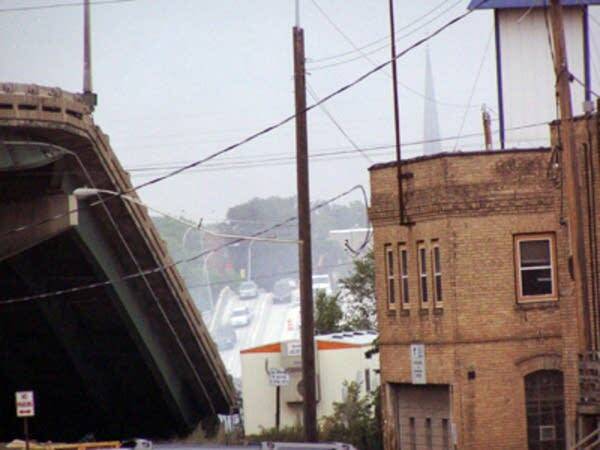 Blog: "35W came down in front of my house"